Step by step guide to install headliner in 1994 T-top Camaro. 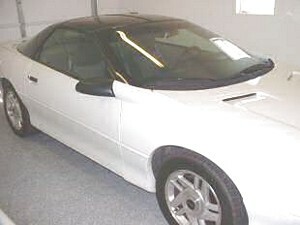 This is a 1994 T-Top Camaro and as you can see by the picture below, it is in great conditon. The headliner has some glue that had seeped through at the front after someone tried to glue the old headliner back in place; and also the headliner was coming loose from the headliner board at the back of the car. 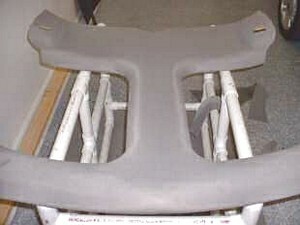 A t-top camaro or any other t-top headliner board may look hard to recover and replace, but if you follow these simple directions, it will look like new once you are done. 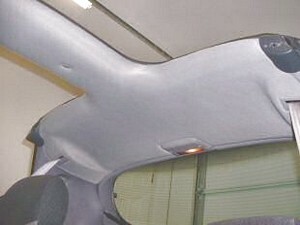 A small to mid sized headliner kit will do this car; click this link to go to the order page. The color we used here is the color 2165 gray. This is a shot of the hanger in the back of the car. 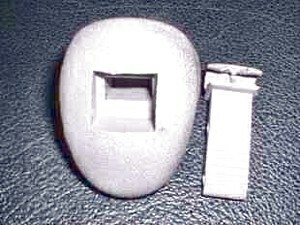 The little plug pops out, and once it is removed the hanger itself will come out easily. 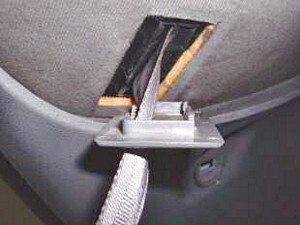 This is a closeup of the seat belt strap trim where it goes through the headliner board. 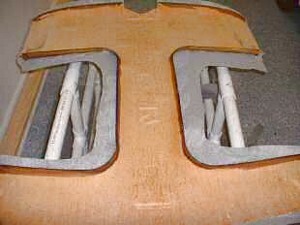 The plastic trim peice snaps out and there is cut that the seat belt will slide through to free the headliner board so that it will come out. You don't have to remove any seat belts from the car. Here is another shot of the seat belt strap cut in the headliner board; be careful when removing old headliner material from around this spot. Remove all the old headliner material and clean the board with a soft bristled brush. This board was in good shape. There were only a few spots that wanted to "come apart" on this board. If the board has some spine left to it (if it hasn't broken into), it can probably be recovered. 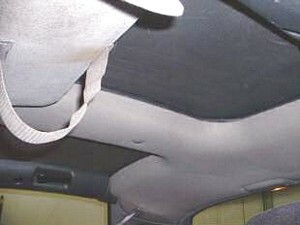 Lay the new headliner material on the board, and make rough cutouts for the recessed areas. 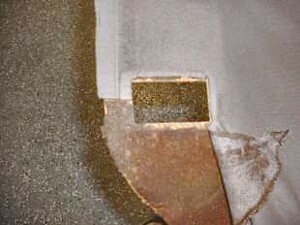 The reason for this is so that you will roughly know where to spray the glue so as not to waste it. 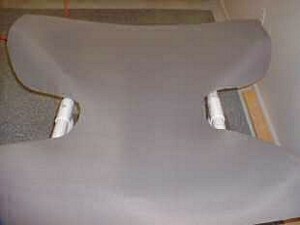 Spray the headliner board and the headliner cloth with glue; about 1/2 at a time and glue it down. At this point it would be wise to only glue the flat surface of the front; working some extra into the bends of the board. 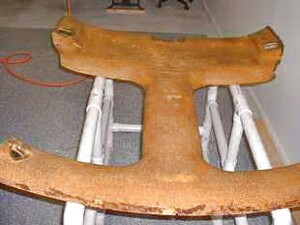 This is done by pressing the cloth into the bend while using the other hand to firmly glue the headliner in place. Now flip the headliner board over, trim the headliner cloth so as to leave about 1 1/2 inches to overlap (a little more at the bends). Glue the headliner cloth to the contours and then fold the headliner cloth over and glue it to the backside of the board. This should be the results of your hard work, a practically new headliner, ready to install Put it back in just like it came out, and you are good to go! There are no special tools needed to do this job, except something to remove the plug in the center of the board without damaging it. Something flat and sturdy to pry it up would work good. You can see the plug in this picture.